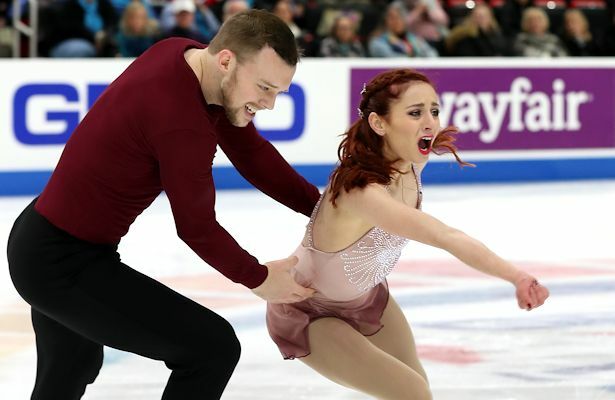 Tarah Kayne and Danny O’Shea perform their Short Program at the 2019 Geico U.S. National Figure Skating Championships. With the national title on the line and only one spot on the team for the upcoming World Championships, only four points separate the top four teams following Thursday’s Pairs’ short program at the 2019 Geico U.S. Figure Skating Championships in Detroit, Mich.
Tarah Kayne and Danny O’Shea lead with 71.83 points, while Ashley Cain and Timothy LeDuc are just behind them with 70.47 points. Kayne and O’Shea, the 2016 champions who won silver last year, began their program to “Turning Page” with a backward outside death spiral, followed with a level 2 triple twist, side-by-side triple Salchows, throw triple loop and level 4 lift. The team earned positive grades of execution (GOE) on all elements. While O’Shea mentioned he was excited to return to Michigan, being born in Pontiac and living there until he was four years old, Kayne confessed she has a unique practice to combat her jitters. Cain and LeDuc, who were fourth last year and third in 2017, opened with a level 4 triple twist but then had an underrotation on the side-by-side triple loops in their routine to “Bella Belle.” However, they redeemed themselves with a throw triple Lutz, and earned a level 4 on the step sequence and combination change spin. This was just six weeks after Cain suffered a concussion. Haven Denney and Brandon Frazier are currently in third with 68.32 points after their performance to “Billie Jean” performed by David Cook. The 2017 U.S. champions, who were fifth last year, knocked out a level 3 triple twist, followed by brilliant side-by-side triple Salchows, a throw triple loop and level 4 lift. Just behind Denney and Frazier in fourth are reigning bronze medalists Deanna Stellato-Dudek and Nathan Bartholomay with 68.18 points. Their routine to “Somewhere” by Barbra Streisand featured a level 3 triple twist and side-by-side triple toes, but she put a hand down on the throw triple loop. Audrey Lu and Misha Mitrofanov, who won the junior U.S. national pairs title in 2018, are in fifth with 66.21 points. Their routine to “Masquerade Waltz” featured a level 3 triple twist, throw triple loop, and side-by-side triple Salchows. Defending champions Alexa Knierim and Christopher Knierim lost points on a messy triple twist and a step out on the side-by-side triple Salchows, and are in seventh place with 61.56 points. Midori Ito (JPN) became the first woman to land a triple-triple jump combination in competition at the 1982 Junior World Figure Skating Championships.